Our company is a master in providing Conventional Fire Alarm System Service. Assisted by a crew of highly deft and knowledgeable personnel, we are engaged in rendering Fire Alarm System Services. These are rendered under the expertise of accomplished employees at par with the norms and standards. More to this, these are accredited among our patrons for its reasonable rates. These systems are developed using the high grade raw material by our certified vendors in compliance set industry norms & standards. The entire range of systems we offer is used for safety purposes. Service & Calibration of All Leading Brands Supply & Repairs of Sensors, Calling Points, Alarm Bells etc. Keeping the diverse requirements of customers in mind, we are instrumental in providing Fire Alarm System Commissioning Service. Fire Active Safety Services Pvt. Ltd.
variable refrigerant flow VRF zoning is an energy -efficient method of providing precise comfort control to indoor environments . Our valued clients can avail from us a wide assortment of Wired, Wireless, Conventional & Addressable Fire Alarm Systems that are designed as per the specific requirements of clients. These solutions find application in homes as well as commercial sectors to detect smoke and fire in an particular area. 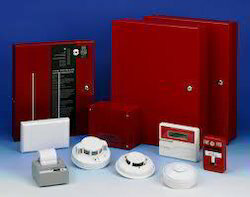 INSTALLATION OF FIRE ALARM SYSTEMS IN YOUR PREMISES. We have gained a remarkable position in the market that is involved in offering Fire Hooter Service. Sree Rama Fire Services & Co.
We also offering installation and maintenance services for the Fire Alarm System.